Marie Dennis is a woman who weaves peace and reconciliation all around her and beyond, from the grassroots level to a global level where important decisions affecting all of our lives are being made. She is gentle and soft-spoken, but a strong leader who exudes confidence and clarity of purpose in whatever mission she undertakes. She believes in, and works on inter-religious and inter-cultural dialogue, and is an advocate of active non-violence or seeking peace by peaceful means. She is a “voice for peace”- highly sought after to give keynote talks at conferences and universities, for retreats, for media work, and more. Professionally, Marie has played various roles: in Washington, DC, for example, she was on the White House Task Force on Global Poverty and Development. She is now co-President of Pax Christi International, since 2007, and was director of the Maryknoll Office for Global Concerns from 1989 to 2012. She has helped raise awareness in the US and other world bodies about the impact of various government policies in northern countries on the poorer countries in Asia, Africa and Latin America, in an attempt to bring justice and peace to a world torn apart by economic injustice which threatens global peace. Marie is a mother of six and holds a Master’s degree in Moral Theology from Washington Theological Union as well as honorary doctorates from Trinity Washington University and Alvernia University. She is author or co-author of seven books, including Oscar Romero: Reflections on His Life and Writings, St. Francis and the Foolishness of God and Diversity of Vocations. Simply put, Marie Dennis has shown and continues build on a lifetime commitment to worldwide peace. She exemplifies what it means to be a “citizen of the world”. Marie Dennis, co-president of Pax Christi International has a long history of commitment to create peace rooted in her deep spirituality of following Jesus the non-violent. What Pax Christi is in today’s world in more than 50 countries in the world owes very much to her Spirit filled and Spirit led leadership. She is a woman who weaves peace and reconciliation all around her and beyond at all levels, from the grassroots where people are to the global level where important decisions that affect their lives are made. What is remarkable about Marie is her faith vision which is deeply incarnated to be translated into concrete actions. Her life reflects what she believes, loves and searches. She is a sister, a friend, a healer, a mentor and a companion of our common journey to enable a new heaven and a new earth. The Internationally Reputed Peace Maker Prize. She is an accomplished woman, having led many peace and justice organizations, most recently including as Director for the Maryknoll Sisters Office in Washington DC and the Pax Christi International as Co-President. I truly hope that she will be the one to receive this prize. Marie Dennis is co-President of Pax Christi International (PCI) and has been a long-time peace advocate not only in the United States but in the world as well. I would say she has given all her life to the cause of promoting peace in the world!!! She is an advocate of active non-violence or seeking peace by peaceful means. She has influenced and inspired countless people who have become peacemakers themselves, including myself. Because of my association with Pax Christi International, I saw up close how she pursued her peacebuilding work. Through her leadership and that of her co-workers in PCI, she has addressed significant social and global issues. Among these issues are the protection of human rights and the renunciation of war as a means of resolving conflicts. The amazing thing is that she is able to do her work with vigor and activism, but at the same time she maintains her respect for everyone concerned. She is gentle and at the same time possesses positively-oriented dynamism. She exudes inner peace and at the same time strongly works for social peace. She “walks her talk as” we say. I have all the confidence that she is very deserving of this prize. I sincerely hope and pray that she will receive this recognition! 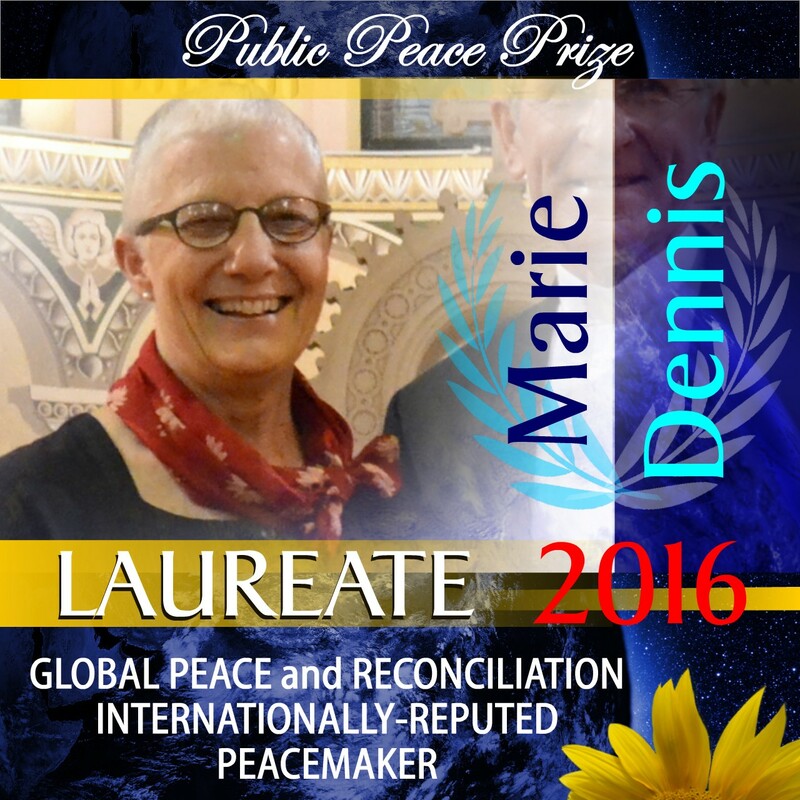 Herewith I would like to nominate Marie Dennis, copresident of Pax Christi International for the public peace prize. Marie Dennis has shown a lifetime commitment to peace, worldwide peace. She has up to today been promoting non violent conflict resolution to any national and international conflict. As a person, she embodies peaceful dialogue and is thus able to promoting international cooperation. I would be a major recognition of the strength of personal, authentic commitment in international peacework, when Marie Dennis would be awarded this price. Marie Dennis, Co-President of Pax Christi International, is, at once, a strong and gentle woman. During the last years she has been an important point of reference for all the activities that Pax Christi International usually promotes: peace education activities, non-violence actions, disarmament campaigns. Moreover, she has always given first-hand evidence of the values she believes in, by visiting many conflict situations in various countries all over the world. In 2009, Marie Dennis led a delegation of Pax Christi International to Iraq, a land torn by war and violence. Due to her qualities and skills, thank to her kindness and depth, she has always been able to bring hope where hate rules; she has always been able to start new steps of peace where war seems to be the only option. Her peace action in Iraq is just one example of her nonviolent commitment against any war. In our very difficult and violent days, she is still a very inspiring person for Pax Christi International: in 2015, Marie Dennis will guide the general assembly of Pax Christi International in Palestine, Bethlehem. I would like to nominate Marie Dennis for this award. Marie has a great breadth of experience and commitment to international work for peace, through her links with Pax Christi, the International Catholic Movement for Peace, through her work as former Director for the Maryknoll Office for Global Concerns and her personal work through Franciscan lay and religious networks. I have personal experience of working with Marie for around twenty years and find her a woman of great depth: she brings a spirituality to her approach to peacework that helps to connect people around the world – seeking to find common approaches to active nonviolence and peacemaking and to celebrate these. She also has great intellectual depth and applies this to her global experiences which help provide a thorough analysis of many situations of violence and conflict. She is unstinting in the time and energy she gives to her peace work but manages some to keep this in balance with her community and busy family life – I think a deep prayer life helps with this. Please accept my support for Marie for the Public Peace Prize. It is my pleasure to support the nomination of Madam Marie Dennis, Co President of Pax Christi International, for the Public Peace Prize 2014. I met Marie for the first time in an International Fact Finding Visit to Colombia in 2006, to better understand the complex and longstanding Colombian conflict and the role of the local and National Church in accompanying civilian victims of the war. For me, Marie Dennis is a vibrant, hardworking woman at her age, full of energy and wisdom. She has always played a key role in promoting peace and advocating for justice at a global level. Marie has been a light for many people in the US and for Pax Christi International Member Organizations, she has always devoted her time to strategically support others, from her humble way of life and talent to coordinate with others -no matter if they are other national/international organizations, other faith based organizations, communities at a grassroots level, in particular defending human rights and promoting peace in the world. I have witnessed Marie’s dedication for her entire life to the cause of the poor and vulnerable. From her current position as Co President of Pax Christi International, she has taken this as a good opportunity to accompany Pax Christi sections in their commitment for peace and reconciliation, and she has been an inspiration for the new generation in spreading hope that a peace future is possible. – She is so highly regarded and serves as a model for many people all over the globe in what it means to be totally dedicated to peace, embodied in her personal life and in her decades-long work for peace at the local, national and international levels. – She has been in leadership with Pax Christi International, the global Catholic peace movement, for many years and currently serves as co-president. The model of a lay woman serving with a bishop in this leadership post, itself inspires. – She also has served in leadership for Pax Christi USA (PCUSA) and was named PCUSA “Ambassador of Peace;” thus, representing the U.S. Catholic peace movement in numerous coalitions, at home and abroad, working on peace. – Her travels to war-torn zones and areas of conflict is motivated both by her own commitment to draw close to the victims of war and violence, and by her commitment to build cross-border solidarity in ways that are accountable to the communities most affected by war and violence. – She is a “voice for peace”- – highly sought after to give keynote talks at conferences and universities, for retreats, for media work, etc. –as she not only brings a wealth of experience on peace and justice concerns, but she also stirs the moral imagination to help us believe that “another world is possible”…a world without violence, and then to work for it!. – Her voice for peace is also captured in her writings: she authored or co-authored seven books and many articles in an array of publications. – She co-founded (over 25 years ago) and currently lives in an intentional community in Washington, DC, located in the inner city, which draws people committed to a life-style of simple living and working on half of justice and peace; thus serving as an alternative model for living out a commitment to peace. – She truly embodies the Gandhi quote “be the change you wish to see in the world” in the way she humbly lives out her life, expressed in each interaction with another, in the way she raised six incredibly beautiful children, in her courage to “speak truth to power” with respect and grace, and in her daily spiritual practice which anchors her profound commitment to peace. Many of us already try to emulate Marie’s goodness and commitment to peace—so if she could be recognized with the Public Peace Prize, she would inspire many more. I met Marie Dennis, co-President of Pax Christi International (PCI), when she visited the Philippines and also in a few occasions at the United Nations in the course of my own disarmament advocacy at the UN. I am also aware that for a long time she headed the Maryknoll Office of Global Concerns and in that capacity she has made significant contributions to promoting global peace and justice. She has worked in the area of protecting human rights especially women’s rights. When the three Maryknoll nuns were raped and murdered by security forces during the dictatorship in El Salvador, she worked relentlessly to bring this issue to the consciousness of and action by the US government. She was also active in getting the US bishops to issue a statement against nuclear weapons. In short she has been a proponent of disarmament and has carried this advocacy in her leadership role in Pax Christi. She is also a strong advocate of active non-violence. In her talks at various forums, she has spoken tirelessly about de-legitimizing war as a means to deal with disputes. She has bravely challenged the notion of a “just war”. When she came to the Philippines two years ago she inspired the youth she met with. She encouraged them to be the successor generation of peace workers. Therein lies one of her main contributions: getting the youth to be interested in peace work as this is the hope of our world’s future. In her gentle yet strong way, she has been able to persuade and influence both the young and adults that she encounters about the peace and justice imperative. I believe that she is very deserving of this prize! I was trying to find ways to express my admiration for Marie Dennis as a peacemaker when this verse from 17th century poet, George Herbert, came to my mind. To me, the verse captures Marie’s fine qualities. She shows at all times a strength and calmness founded on years of experience of life in all its facets. She has experienced and endured joy and sorrow, she has seen success and lacked it but all this has left her stronger, increased rather than diminished her poise and capacity for life. Her experience has formed her into what she is and what she brings to any company. Many years ago, I stayed in the community of which Marie is part in Washington DC and saw how well she immerses herself in a sharing lifestyle. I know that she has lived and worked among the oppressed and suffering as well as advocated for them in the seats of power and that she has the capacity to be respected and admired in both places. To all that she does, she brings a demeanour which speaks of her underlying love for humanity wherever it is found. We live in times of great insecurity and fear of the other but Marie moves in that world with a sureness built on great faith that all will be well, that all manners of things, a te wa (in God’s good time), will be well. She has been co-president of Pax Christi International through some difficult times, crises that threatened the future of the movement but her steadiness has carried us through those times and into a more hopeful future. I have no hesitation in recommending her for an award which recognises her contribution to Pax Christi and to the vision of peace for all everywhere. Herewith I would like to send you my nomination of Mrs. Marie Dennis for the Public Peace Prize and motivation why I endorse her candidacy. I wish to nominate Marie Dennis for her distinguished and longstanding commitment to peace. In her capacity as co-president of Pax Christi International and until recently as director of the Maryknoll Office for Global Concerns, in her writing and public speaking, she has played an invaluable leadership role in articulating a peace agenda for our times. Over the years she has given a powerful example to others and mentored them in developing a more effective approach to peacemaking. In her contacts with decision-makers in the United States and internationally, including the United Nations and international financial institutions, she has spoken clearly and courageously for a new approach that is respectful of the rights of the weak, the poor and the vulnerable. She has cautioned against policies that recklessly pursue the use of force, when other wiser and more humane approaches are at hand for the peaceful settlement of conflicts. Marie Dennis is an inspiring ambassador for peace. The award of the Public Peace Prize would be filing recognition of a lifetime of service to peacemaking and peacebuilding. Chair of the Editorial Board of the scholarly journal Global Change, Peace and Security, recipient of St Michael’s award for distinguished service to the community, Former director of the Centre for Dialogue (2006-2012), former President of Pax Christi Australia, former convener of People for Nuclear Disarmament. We have the greatest respect for Marie Dennis. She has been working over decades for peace and reconciliation, on all continents, in so many different cultures in so many capacities, often on a volontary basis out of a deep spirituality. She deserves the greatest recognition. It was right and just, as we say at our daily Mass, for Marie Dennis’ name be brought forward for the Public Peace Prize! I worked for/with her at the Maryknoll Office for Global Concerns! We were constantly called to see world injustices and labor for Peace, worldwide… by Marie. She it was who had the Vision and the courage to keep at it when everyone else was ready to close shop if the going got hard or things seemed out of control… whether in Central and South America, Africa, or Asia. Her demeanor and commitment inspired us and others with whom we cooperated to work just a little harder and pull together a little more until at least, this one thing was accomplished… sometimes it wasn’t accomplished, but we kept on if that was called for. We worked together in our NGO at the United Nations where she brought the voices of the marginalised; to mention some, farmers from Latin America, young women from Africa, and many more to speak out where the world could hear them. When she left the Maryknoll Office for Global Concerns for Pax Christi International we knew that this Christian Woman, committed so totally to Justice for all particularly those most in need, would bring her energy and voice to the whole world and that she would make a difference for many. I met Marie Dennis at Franciscan and Pax Christi Conferences. At the former she and Fr. Joseph Nangle OFM presented their Franciscan faith values as described in “St. Francis and the Foolishness of God.” At Pax Christ Christi I was impressed with her simplicity and humbleness as she works and acts for peace around the world, in spite of very busy family life. I support Marie’s nomination. She has worked tirelessly for peace her whole lifetime. Marie Dennis is exceptionally well-qualified for this award. She is an inspiration to us all. We support Marie Dennis’ nomination for the 2016 Public Peace Prize. Her tireless, long-standing work on behalf of world peace, her global spirituality, and her servant leadership for decades with Pax Christi qualify her unreservedly for such public recognition. With a strong dedication to Social Justice, Marie Dennis is an ideal candidate for the Peace Prize. She has a long record of dedication to the cause. Her reputation is international, and she denounces Empire by word and action. She lives what she advocates. Please choose Marie Dennis for the Peace Prize. I have known and collaborated with Marie Dennis for over thirty years. She always has been in the forefront of social justice issues, even risking her own life in the work to help others around the world. Her calm, balanced, centered approach to difficult issues has enabled many groups to find nonviolent ways to work toward peace and reconciliation. She is well deserving of the Public Peace Prize. Retired – Associate Director, Office of Justice and Peace, Catholic Diocese of Richmond. I would give my vote for Ms. Marie Dennis for this year’s Peace Prize. I worked with Marie at the Maryknoll Office for Global Concerns for over 2 years, and she is certainly dedicated to the cause for Peace in the world. I have been acquainted with Marie Dennis for well over 25 years, and thoroughly support this nomination. Marie’s commitment to peace, both publicly and on a more personal level has been an inspiration to all who know her. Her quiet calm, her measured assessments of any given situation and her, what seems to me, her enduring, unwavering commitment to a just and lasting peace and her faithful and inspirational personal witness make her an outstanding candidate for this award. Marie seems completely worthy of this beautiful recognition. Her work for peace is authentic and remarkable. Who can surpass her enormous dedication? Please cast my vote for Marie Dennis. I would like to nominate Mrs. Marie Dennis for the Public Peace Prize. She has pursued peace in a peaceful manner. I should like to see Marie Dennis receive the Peace Prize. She has been faithful to put herself in discomfort to oppose the build-up of nuclear power at Oak Ridge and other places, even to the point of going to prison for her beliefs. She has been consistently opposed to military madness and protested in her gentle way. I think she truly imitates Our Lord’s method of leadership. Marie Dennis had dedicated her life to Peace and Justice. She understands the individual, cultural and systemic roots of injustice and aggression. She had worked to remedy as many of these conditions at the local, national and international level. Her efforts have encouraged more people to become involved to create God’s Kingdom on Earth! I vote for Marie Denis to receive the Peace Award. I would like to nominate Marie Dennis for the 2016 Public Peace Prize. I have known Marie for over 20 years and followed her tireless work for peace worldwide. I would like to support Marie Dennis for her beautiful work she’s doing to others. I never met her but I read about her work and contribution to justice and peace through a little booklet I received from another beautiful human being. In search of more booklets to give to others I discovered the Pax Christi USA and read about Mrs. Marie’s nomination for the Public Peace Prize. Therefore, please count this writing in support of Marie Dennis. Thank you. I am pleased to endorse Ms. Marie A. Dennis for the Public Peace Prize for her decades of pastoral, thought, and executive leadership to promote global peace and justice. Through the quiet power of her words and her example, she has provided an inspirational light for a Church and a world in great need of principled and authentic leadership. In her scholarship, peacemaking via Pax Christi International and other organizations, community building, and works of mercy—known and unknown—she is the model of a center of concern. The example of her dignity, grace, humility, and fortitude as she heads into the world’s trouble spots, and rallies others to reflect, care, and respond, provides a profile in courage and bridge building. She inspires me to get up to go to work every day to support our common hope for the renewal of the earth and the building of a new humanity. I am proud that Ms. Dennis is among Center of Concern’s Community of Creative Voices and I am delighted to note the many voices here in support of her nomination for this prize and in recognition for her leadership. I recommend her most highly. Lester A. Myers, President, Center of Concern, Washington, D.C. I support the nomination of Marie Dennis. She works to support peace in all she does. Marie accompanied Diana Ortiz, OSU during her fast in front of the White House to gain information about her torture case from the State Dept. I travelled to DC to support Diana and witnessed first hand the myriad of ways Marie protected and supported Diana. She talked to reporters on Diana’s behalf, handled crowds, DC police. She offered calm and reassuring support when we were arrested on Diana’s behalf. Marie is a wisdom woman who walks her talk. She definitely deserves this recognition. I can only say AMEN to all the voices of support for Marie Dennis. I have known her for over 40 years and I cannot think of anyone more worthy of this award. Year after year after year her work for peace has been a shining example for others. Her six children are a beautiful reflection of their mother’s goodness. Humility stands out among her many beautiful qualities. It is a privilege and an honor to support the nomination of Marie Dennis for the Public Peace Prize. We had the opportunity to know Marie while serving with Maryknoll Lay Missionary. She is a woman of deep faith who has been reaching out to the marginalized and actively promoting peace most of her life. She walks the talk as Pope Francis has been encouraging all of us to do. I vote for Marie Dennis. Ever since I have known her she has been promoting peace, justice and human rights, thousands of hours, never thinking of herself. I cast my vote for Marie Dennis not only for what she has done to further peace and justice in the world but for who she is – a person of deep humility and wisdom who seems not to act out of egocentric needs but in response to what the world needs. In her passion for peace and justice she has been compassionate, moving many of us who try to be her co-actors from anger to unconditional love for all – even towards the ‘enemy’ or towards those who disagree or whose actions thwart the progress towards our shared ideal that ‘His kingdom come on earth’. Marie is so successful as a peace maker because she is peace-filled. I am pleased to join so many others in voting for Marie Dennis for the Public Peace Prize. Marie Dennis is a woman who weaves peace and reconciliation all around her and beyond, from the grassroots level to a global level where important decisions affecting all of our lives are being made. She is gentle and soft-spoken, but a strong leader who exudes confidence and clarity of purpose in whatever mission she undertakes. She believes in, and works on inter-religious and inter-cultural dialogue, and is an advocate of active non-violence or seeking peace by peaceful means. She is a “voice for peace”- highly sought after to give keynote talks at conferences and universities, for retreats, for media work, and more. She has vigor and is a special peace activist, but at the same time she maintains her respect for everyone concerned. Gentle and at the same time possesses positively-oriented, Gospel-centered energy. Exudes inner peace and at the same time assertively works for world peace. Incredible, tireless international traveler striving for a more peaceful world bringing hope where hate rules. Harmonious, gentle yet determined broker for a more peaceful, non-nuclear world. All of this flows because she is living life as a Secular Franciscan. Served on the JustFaith Board for 7 years from April, 2008 to April, 2015. – Advent Reflections: “Voices of Hope, Women of Wisdom. — director of the Maryknoll Office for Global Concerns from 1989 to 2012. — As a contributing editor to Sojourners magazine. Simply put, Marie Dennis has shown and continues build on a lifetime commitment to worldwide peace. She exemplifies what it means to be a “citizen of the world” and a global advocate for peace. She has helped raise awareness in the US and other world bodies about the impact of various government policies in northern countries on the poorer countries in Asia, Africa and Latin America, in an attempt to bring justice and peace to a world torn apart by economic injustice which threatens global peace. What a woman! What a role model for me of what it means to be a peace-seeker and a peace-maker! I would like to cast a vote for Marie Dennis. Marie Dennis deserves the Peace Prize for her dedication and continual work for peace. PAX Christi Memphis is a dedicated group of individuals who have been working to help bring peace to Memphis, often following the lead of the greater PAX Christi. We enthusiastically support Marie Dennis, co-president of Pax Christi International, to nominate her for the 2016 Public Peace Prize. Marie is a remarkable peacemaker, and PCUSA Ambassador of Peace. In the years we have known Marie, principally as Maryknoll Affiliate, we have not met anyone who has lived and preached for Peace than this wonderful peace filled woman. I support Marie Dennis for Public Peace Prize. I can’t think of another person who I could be more thrilled to see nominated for the Public Peace Prize. Marie is a model for how to be a peacemaker in the 21st century. She is steadfast and true to her core principles, always finding ways to amplify the voices of those on the margins of society. She has certainly taught me so much through her work with Pax Christi and in the DC community. Her mentorship over the years has been felt by me and many others around the world. I strongly endorse the candidature of Marie Dennis for the public peace prize. I know her and her extraordinary commitment for peace and non-violence. I agree to the statement of Noam Chomsky who said that United States currently is a thread to world peace. Therefore we need especially people in the United States who are really engaged in peace. From Germany best wishes for all people of peace around the world. I vote for Marie Dennis to receive the Public Peace Prize because of her longstanding efforts for developing peace in the world. I met Marie Denis last May at the Pax Christi International Conference. She is an inspiration for her practice of peace and nonviolence and her tireless efforts to promote peace in every part of the world. She is so deserving of this prize. Thank you for this opportunity. I have known and been inspired by Marie since the ’80’s. Yes, she is a peacemaker. During two terms in leadership for the Maryknoll Sisters I was privileged to see Marie’s work for the Maryknoll Office of Global Concerns. She is a dedicated worker who perseveres toward the best end and who personally remains peaceful through it all. I submit my vote for Marie Dennis, Co-President of Pax Christi International. Marie Dennis, Co-President of Pax Christi International and a Maryknoll Affiliate, has been nominated for the Public Peace Prize. I highly endorse her for this prize. I enthusiastically support Marie Denis for her unstinting commitment to justice and peace and nonviolence. Her work and writing are a constant encouragement to me and others. I would lie to support Ms. Marie Dennis for Peace Prize because of her great work at Pax Christi International. It is with great joy that I support the nomination of Marie Dennis. Her dedication to being the peace she promotes both globally and locally is a great inspiration. Her ability to motivate people to develop peaceful solutions is exemplary. I wish to vote for Marie Dennis for the Public Peace Prize. While I do not know her personally, I have been impressed with her devoted work for peace for years and cannot think of anyone who more deserves this recognition. Her leadership in Pax Christi International alone has been of such great significance as to warrant the prize. I wish to endorse Marie Dennis for the Public Peace Prize. She is a person who has done a great deal for peace throughout her life. I nominate Marie Dennis for the Peace Prize and support the wealth of comments already made that portray her dedication and commitment to working for peace and justice in local and international arenas. She would be a very worthy recipient. BethAnn Slater: Marie Dennis is not only the most well deserved person for this prize for all the ways listed about her and more she is also my mom! I continue to be in awe of her ability to find the hope and work hard walking the walk of the talk that she does even better! To listen to her knowledge and understanding as well as her delivery on all aspects of her work for peace in so many corners of our world in any setting makes her even more my idol. She truly, with all of her being, knows that peace is not only possible but the essential component of the New Creation! Deanna Phyllis Cattell: Marie Dennis is the personification of peace selfless working for others taking on responsibility. At the international level. Her personal and public values are the sane. I believe she is the most worthy recipient for the peace prize at this time. Marie has been a tireless advocate for peace for many years. She has organized events, stepped up to witness against injustice, and provided inspiration and support for numerous organizations and individuals working for peace. Marie Dennis is an inspirational leader of Pax Christi, showing all that accepting the call to holiness must including accepting the path of peace and non-violence … that fostering spirituality can help lead us to work for the non-violent, peaceful and just world that God’s infinite mercy so longs for us to build. I support her nomination for this prestigious honor. I add my voice to the many others in support of Marie Dennis. She is a woman of great depth, generosity, spiritual maturity, and courage. She is a citizen of the world and a tireless worker for justice. In my opinion, Marie Dennis is worthy of all the praise and appreciation she receives. She has given tirelessly of herself and inspired so many with her gentle spirit and wisdom. My hope is that this award will continue to open doors for her to bring her light of peace and harmony where ever she goes. Marie is the perfect person for this award. Her outstanding work in peace and justice over many years and her deep faith life make her my choice. I have listened to her and seen her work – in the US and in a visit to Honduras. She seeks to be a voice for peace and for those who suffer from poverty and violence. To say Marie deserves the award doesn’t bein to cover her life of accomplishments. To be the mother of six, write several books…travel the world…serve on boards, while involved in furthering peace on every level…reminding us how we are all connected in God’s Divine design, overwhelms me. There should be no question as to her being recognized with this significant award. I am thrilled to vote for Marie for the 2015 Public peace prize. I first met Marie in Guatemala in the late 1980’s and have been most impressed with Marie’s deep, long term commitment to work for justice and peace and integrity of creation. My admiration of her has continued to grow and she challenges me to live my life in a more peaceful way, seeking to promote justice for the most marginalized of society. I have heard Marie speak. I have read much of what she has written, and am inspired each time I encounter either her person or some aspect of her work. When it comes to peacebuilding Marie never tires. When I became involved with the work of peace and justice as a young college student, I met Marie. She was a role model to me and many others of a person who lives with integrity, deep faith and a joyful spirit. I support her nomination and am grateful for her life’s witness. Marie has always been a model of gospel-based peace-building for me. I tried to listen to her suggestions. Marie is the perfect person for this award.Her outstanding work in peace and justice over many years. and het deep faith life make her mij choice! Marie Dennis is an inspiration in her life of compassion, mercy, and dedication. We support Marie Dennis for this award. She is an Inspiration! I am honored to know Marie, she is an inspiration and a role model for all those seeking to make the world a better place. She truly understands a holistic picture of nonviolence and peacemaking, lives with integrity, is gentle and kind. We need more people in the world who live out their faith the way Marie does. I can think of no one who deserves this prize more! I have had the privilege of meeting Marie Dennis many years ago in the midst of challenge in my own life. She was then and is now a power of example in a multitude of ways. Her personal and public life converge and are exhibited in the ease in which she shares with others. This makes her an unique example of inspiration….. I wholeheartedly support her nomination…. For decades I have known her commitment to address the global concerns that trouble the universe. I was proud of Maryknoll when she was named the Director of our office of Global Concerns in Washington, DC. I have been a Maryknoll missioner in Latin America for more than 40 years and we have always counted on her support to champion the cause of those who suffer the negative consequences of the cultural globalization. She was one of the reasons Maryknoll had such credibility among those in Washington who were in solidarity with the voiceless around the world. I am a witness to her being a person who “walks the talk”. Her entire life is at the service of the poor and the oppressed. Rev. Thomas P. Henehan, M.M. For the inspiration Marie Dennis has been to many, and no doubt will continue to be to many in the persuit of peace in our world. She deserves this nomination and with no doubts, it reflect favourably on the Public Peace Prize to be associated and greatly served by the support that Marie’s life’s work brings to it. Marie Dennis has been a role model and source of encouragement for me for many years — her intelligent, informed and spirit-filled words and actions are a constant reminder of how we can create a more peaceful world. I would like to nominate Marie Dennis for this year’s Public Peace Prize. Marie chaired Pax Christi USA’s National Council while I was National Coordinator. Her wisdom, insight, discernment and welcome of all was evidenced in the initiatives she shepherded during that time: collecting signatures from US bishops asking the US congress to end military aid to El Salvador, Cry for Justice, a nonviolent intervention in Haiti during the military coup there in the fall of 1993 when the US military and UN observers pulled out because of the danger; election observer delegation to Haiti first to approve a new constitution and then for the first democratic elections for president; a revised mission statement and goals included, for the first time, both racial and environmental justice; gatherings of young adult retreats and forums; gatherings of local and regional leaders to increase their voice in the movement; etc, etc. Her position as chairperson of the national council was a volunteer position and was in addition to her very full-time ministry at the Maryknoll Office of Justice and Peace, as well as her life as a mother and member of the Assisi community in Washington, DC. In every area of her life, she models nonviolence, reverence and joy. I fully support the nomination of Marie Dennis for this award. I have known Marie for many years and have admired her witness to peace, both in her many years with the Maryknoll Global Concerns Office and with Pax Christi. She is most worth of this award! I vote for Marie Dennis to receive the Public Peace Prize. I have heard Marie speak a number of times. We use the book she co-authored Francis and the Foolishness of God for affiliate orientation for Franciscan Sisters of Perpetuate Adoration, La Crosse, WI. I have been inspired by her lifestyle, her commitment to non-violence, to protecting creation. Her gentle way of living would make this world a better place. Marie even came to Charlotte to speak to our SJ group and back to DC the same day. She inspired the group. Marie Dennis is a woman who exudes peace in all her interactions. She lives her life honestly and according to principles that serve to lift up those in her midst. Her constant quiet presence in settings of conflict serves as an example of what human beings can achieve if only we open our hearts to God’s voice. I join the others who have so eloquently described Marie’s work for peace in her city and around the globe. I had the pleasure of living with Marie in community for more than three years. The stories she humbly shared around the dinner table of her travels for peace were similar to the daily interaction we encountered in community. She brings a very intelligent, compassionate, peace filled perspective to any conversation. Marie Dennis has indeed been a guide and influence for justice and peace in many continents and countries throughout the world. At the same time, I would like to commend and thank her for offering her high spirits, grounded hope and well informed leadership with the local faith communities in the Washington, D.C. area. For over thirty years, I have been the recipient of Marie’s guidance, encouragement, as well as her gentle, powerful presence to groups with which I have worked in several local parishes and high schools. I totally support Marie as the recipient of the 2016 Public Peace Prize. In my trips to Washington, DC I have often encountered Marie working tirelessly for Peace and Justice, Her writings have taught me much about true peace and commitment. I recommend her for the 2016 Public Peace Prize.